Himalayan salts contain 84 minerals and trace elements that are highly beneficial for the body. Bathing in a Himalayan salt bath will help to eliminate toxins, stimulate circulation and can help to relax tired muscles. With 100% pure Himalayan salts & essential oils of rose, lavender & cedarwood. 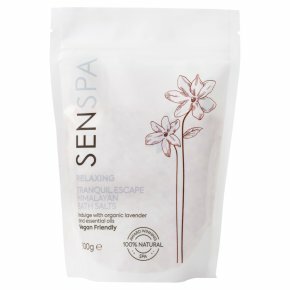 100% natural - natural body therapy.Sen Spa have sourced pure unprocessed Himalayan Salts, found deep within the rivers and valleys of the Himalayan Mountains. Himalayan salts contain 84 minerals and trace elements that are highly beneficial for the body. Bathing in a Himalayan salt bath will help to eliminate toxins, stimulate circulation and can help to relax tired muscles. It also helps relieve stress and tension to aid better sleep. The salts are combined with a beautiful blend of pure essential oils including rose, lavender & cedarwood - lie back and soak in some of the purest salts found in the world. Sen Spa Himalayan salts are mined by hand and are premium grade, pure and unrefined. Directions: Add two handfuls of salt to a warm bath. For concentrated use (for detoxification or in cases of extremely dry skin or aching joints) pour the full contents of this pack. Soak for 20 minutes before rinsing. Directions: Run a warm bath, add two handfuls of salt and continue to stir until dissolved. For concentrated use (for detoxification) pour the full contents of this pack. Soak for 20 minutes before rinsing.